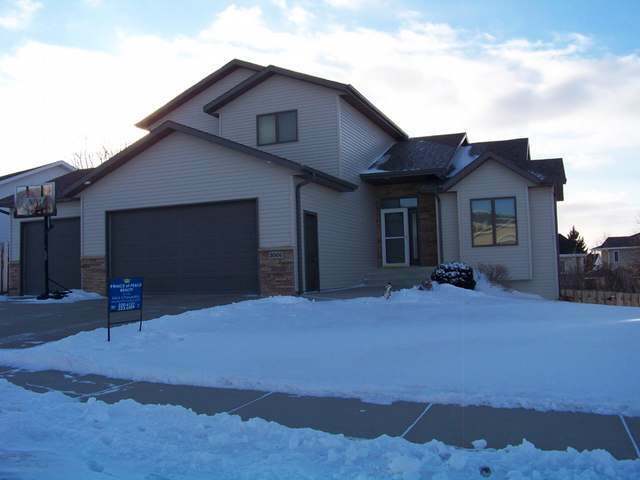 This 5 bedroom 4 bath home has it all! Beautiful custom kitchen with center island with a deck off the dining area. Living room is inviting with high ceilings and a warm fireplace to relax by. Large office with glass doors off the living room also. Coming in from the garage, there is a half bath across from the laundry area. Makes it easy to clean up after working in the spacious 4 stall garage! Heated and insulated, it has a floor drain and hot and cold water also. The main part of the garage is 24x34 and there is an additional 10x22! Giving a total of 1036 sq. ft. of garage! Upstairs features 2 nice sized bedrooms, a built in desk in the hall and a fabulous master suite you may never leave! Large room with walk in closet, full bath featuring a sit down shower and a jacuzzi tub! Downstairs there is an additional 2 bedrooms with egress windows, large family room with another gas fireplace, game room and a walk out basement to the fenced yard that has a sprinkler system!